The headline is not misspelled. I just love neo-logisms…Entre+penury. 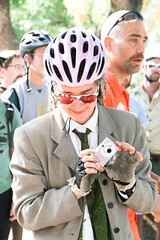 I’m all business at the start of the Napa SingleSpeed World’s in 2008. Probably takng a picture of my photographer. I love photographers, images, and this collective dream of a bicycle cult. Napa was my fourth world championship among the single cognoscenti, with each year’s outfit more stunning than the last. The race course was held on the grounds of the old state mental hospital. The one that Governor, then President Reagan suffocated by depriving it of funding. Of course, the vast tract of sylvan repose, hundreds of acres, had to be sold off…luckily Napa folk toiled for years until it could become undeveloped parkland. Is it just a happy coincidence that several hundred bona-fide madpeople who manage to survive thanks to the bicycle? In a way, it’s a poetic justice to have the fools on the hill…. The tie, vest, shirt and jacket say it all: “Here come the suits”. About “entre-penury”: several times the mini-Canon did a good job, good enough to snag a small fee for service. Racing hasn’t paid for…oh, twenty years, so why not documenting races? I remember how hard ‘real’ photographers like Pierre Hilgers, Tom Moran, Dave Stewart and Robert George worked, jammed together in a pack at the start line while I waited in the pack, pinned, primed, and shivering –despite the shabby cashmere armwarmers–in my lycra suit. (this at World Championship races in foreign countries, where the American team was managed by extremely drunk officials enjoying their junket)fanning out over the course just as the gun went off. I dropped that poor thing a few too many times, and yesterday I took its stepsister with the 10 gigabites out for a foggy hike. Friend Nick Thain who plays a lot with cameras and fotoshoppe commended my ‘eye’. Other friend reminded me not to get all swelled up. Is it TOTALLY uncool to believe one is ‘great’, even with no tangible evidence? Thinking about Dumb Luck, which all Entrepenuryal artistes enjoy. c) a fertile imagination…or is it ‘furtle‘? d) decades of practice living low on the hog. ~ by jacquiephelan on December 28, 2009.